Halfords are especially good for Black Friday and Cyber Monday deals, with last years including offers on TomTom, Garmin and Autoglym. This year's is sure to be even better with amazing deals and offers in store and online! The sales this year on Friday 27th November and Monday 30th November 2015 will feature deals on cycling, technology, fitness, workshop, bikes, and more! Last year saw some cracking deals on JD bug scooters, Apollo and Carrera bikes, and bike accessories. Whether you're looking for offers on kids' bikes, women's bikes, road bikes or fitness trackers, there's something for everyone! Onto the most exciting part, the Black Friday Competition! 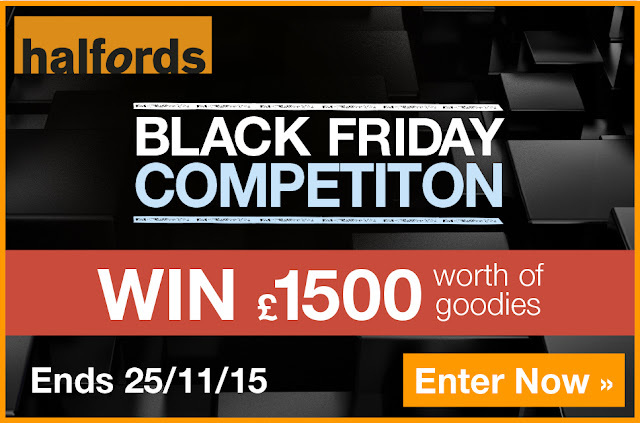 Follow the link to be in with a chance of winning up to £1500 worth of goodies! All you have to do is sign up to the mailing list and answer a simple question. Sign up by 25th November you'll be in with a chance to win 1 of 3 fantastic Black Friday gadget and goodies bundles worth up to £1500! With prizes including bikes, sat navs, car stereos, tool sets and more, this is one competition you definitely don't want to miss out on!